Rodrigo Moynihan (17 October 1910 - 6 November 1990) was an English painter. Moynihan was born in Santa Cruz de Tenerife, Canary Islands, in 1910. His Anglo-Spanish family moved to London in 1918 and then to Wisconsin. A winter in Rome 1927–1928 inspired him to devote himself to art, and in 1928 he started studying at the Slade School of Fine Art in London. In the 1930s he gained a reputation as a pioneer of abstract painting in England, but became attracted by social realism and became associated from 1937 with the Euston Road School. He served in the British Army 1940–1943, first in the Royal Artillery and then in camouflage. He was appointed an official British war artist following injury. He was appointed ARA in 1944. After the war, he was professor of painting at the Royal College of Art 1948–1957, and was elected RA in 1954. At this period, he was in demand for official portraits, and executed commissions of amongst others Princess Elizabeth (1946) and Prime Minister Clement Attlee (1947). He changed direction from 1957, resigning from the Royal College of Art and the Royal Academy and returning to abstraction, working outside England in Europe and North America. From 1971 onwards he was inspired to return to figurative painting in the form of large-scale studio still-lives, unordered, unarranged and apparently random. This return to figuration also drew him to move back towards portraiture – with portraits of friends leading to renewed commissions by the end of the 1970s. Notable portraits of this period include Prime Minister Margaret Thatcher (1983–1985, National Portrait Gallery, London) and Dame Peggy Ashcroft (1984, National Portrait Gallery). 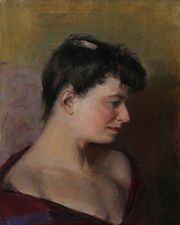 Moynihan was re-elected to the Royal Academy in 1979. He has paintings in the collection of several British institutions including Glasgow Museums, Derby Art Gallery and many at the Imperial War Museum.